Concerts may not be Matthew Diaz’s passion, but they’re certainly his business – a business that he’s cultivated over the course of the last few years. Matt is the mastermind behind I Love Free Concerts, a sort of Thrillist for free concerts. It’s a resource for people who love to attend free concerts (who doesn’t?) and people who’d like the chance to win tickets to see their favorite band or artist. It started with a Facebook page in 2011 when Matt said it was “all for fun.” Then the website launched in September of 2012. Ever since, they’ve played host to over 2 million visitors. They also partner with companies like Live Nation to run a variety of promotional giveaways, giving music fans access to concert giveaways and collecting RSVP’s for free concerts. But I Love Free Concerts doesn’t just list free concert opportunities; the site is much more editorial than that. I Love Free Concerts goes into detail with descriptions of the concerts, including music samples, pictures and explanations about what you’re likely to expect at events. They’re currently based in New York (which works beautifully since there are over 300 free concerts in the summer alone in NYC), but Matt said they’re intending to expand to Boston and DC in the near future. And, of course, the dream is to go national. To be honest, I’m not a big concert person. [..] I was just bored one day and I thought “let me try this new thing.” And it just happened and it grew, and it was exciting. Though Matt may not be a concert fanatic, his passion is certainly what drove him to begin I Love Free Concerts. I used to throw parties, so I guess it stems from that. I love marketing. I love doing research, finding new ways to reach people and making people happy. So it’s more so the hospitality business that I like. For Matt, collecting email addresses is integral to the success of his company (he currently has over 60,000 subscribers). And to collect as many email addresses as possible, he uses a combination of RSVPs and giveaways. RSVPs are a great way to introduce people to new music. For example, Live Nation may be trying to get attendance up for a new artist’s concert. So I Love Free Concerts will then partner with Live Nation to get people to sign up to attend that free show. People in turn will RSVP to the concert by subscribing to I Love Free Concerts and then have the ability to attend the show for free. So everyone wins. Music lovers get to attend a free concert and get exposed to a new artist while I Love Free Concerts has collected more email addresses for their mailing list. We just did a concert with Lorde (she does a song called “Royals”) who is pretty huge right now. In under 24 hours, we had over 2,000 people that RSVPed. So that’s a lot of new people since we never really promoted Lorde before. And now we can get them to enter different contests. The other way Matt acquires subscribers is by running giveaways. 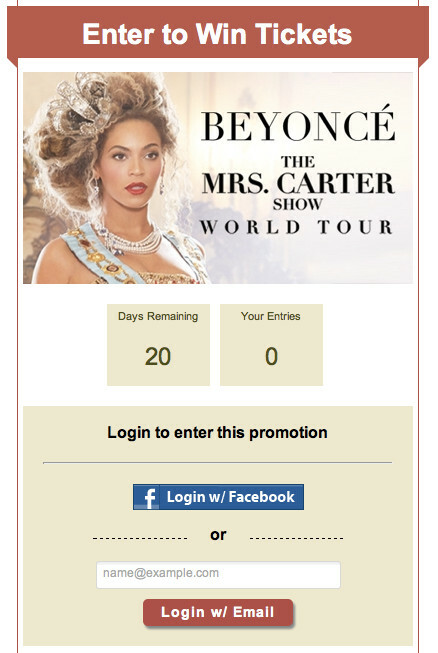 They run all sorts of concert giveaways on I Love Free Concerts, from Justin Timberlake (who Matt says is the most popular artist when it comes to giveaways) to Beyonce (who usually brings in about 6,000-7,000 entries per concert giveaway), to many more big name artists. Matt says this method of marketing works so well because of the time-sensitive nature of the giveaways. Most giveaways will end the day before a concert, so those people who don’t win tickets could often be swayed to buy tickets on a whim, 24 hours before the big show. So following up by reminding those entrants that they can still buy tickets is a very powerful marketing tool. It’s a call to action. To Matt, social media is secondary to email signups. But connecting with people on Facebook, Twitter and recently Instagram is also important. And with “big numbers” on Facebook and Twitter, the importance of a strong social media presence cannot be overlooked. With the help of PromoSimple, Matt has accumulated 135,484 Likes on Facebook and 40,820 Followers on Twitter for I Love Free Concerts. Twitter is his favorite way to connect with people on a personal level. “We do fun things on Twitter,” he said, “so that people know that we’re human.” They love retweeting people who thank them for the free tickets on Twitter. That way, other Twitter users can see that real people are winning their giveaways. Twitter, in a nutshell is an opportunity to build a solid community. 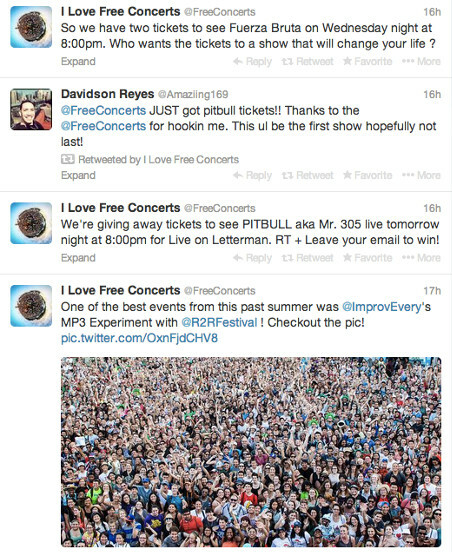 Facebook for I Love Free Concerts is more about business than Twitter is. On Twitter, they’ll post as much as they want, but with Facebook, they’ll only post 4 or 5 times so as not to overwhelm their fans’ newsfeeds. 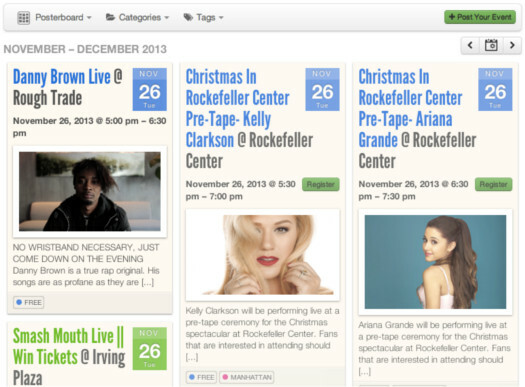 Facebook can be used to get the word out about events. For example, when Matt plans an event in NYC, he’ll use Facebook to reach about 30,000 people per post. I posted a show that’s coming up – it’s a big party that’s happening in Chinatown in NYC at this really cool Dim Sum restaurant that they closed […] just from 2 or 3 posts on Facebook, we get 4,500 people coming to our website. That’s big, that’s traffic. So we use Facebook for that, and we use PromoSimple to get that information. Instagram is a newer venture for Matt, and he said that PromoSimple is instrumental to his success with that social media platform. From giveaways alone, I Love Free Concerts has gained 3,000 followers on Instagram. “Basically PromoSimple is building my Instagram page,” he said. Matt’s a big fan of PromoSimple in general, but one of his favorite aspects is the blog. Want to start making your giveaways more effective? Check out 7 Traits of Highly Effective Sweepstakes.